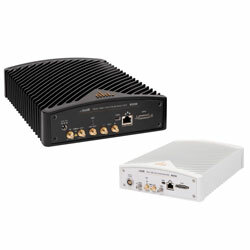 Saelig Company now offers the compact ThinkRF R5x50 Real-Time Spectrum Analyzer series. These devices are powerful, full-featured spectrum analysers, created to monitor wireless signals in real-time and not progressively scanned like many common spectrum analysers. Real-time analysis is crucial for being able to recognise intermittent or frequency-hopped signals. Sleeker, lighter weight and quieter than their previous models, the R5550 and R5750 analysers provide improved spectral performance, lower power consumption, and improved portability at a more cost-effective price over the previous R5500 models. The portable, fanless device comes in 8, 18, or 27GHz versions. The devices provide all the standard options of a sophisticated, expensive bench-top spectrum analyser, but at a considerably lower cost since they use the processing power and display of an attached PC. Frequency controls, marker functions for tracking specific frequencies and multi-trace functionality are all incorporated, as well as a real-time triggering for measuring complex data signals such as Wi-Fi and LTE. Sophisticated FPGA-based digital signal processing within the R5x50 allows the capture of elusive time-varying signals across an instantaneous bandwidth of up to 100MHz.